← Language as a weapon. Had a chance to shoot this 17-shot 9mm pistol recently. Interesting weapons, a pistol equivalent of police Crown Victoria Interceptor, heavy, solid and reliable. Quite accurate, with very minimal recoil. I used it to train a new shooter who found even a smooth-shooting HK P7PSP a bit much. If you like DA/SA pistols with a decocker safety, this pistol would work very well. At $400 with two magazine, it’s not too expensive. 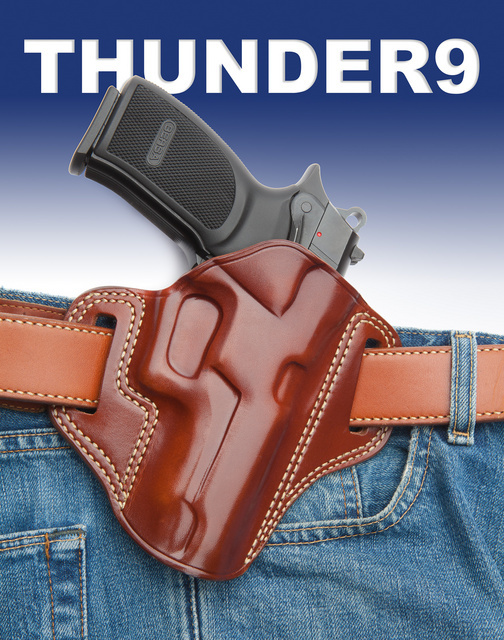 Thunder 9 rides well in a Galco belt holster. This entry was posted in holster, pistol and tagged 9x19, belt, bersa, Galco, leather. Bookmark the permalink. This was my very first semi-automatic pistol. Other than having a pretty rough trigger I found mine to be excellent, until the frame cracked at about three thousand rounds. Eagle Imports, the importer, gave me a brand new one. As part of our “relocation experiment of 2012” my wife and I took the required CCW class for South Carolina. Our instructor carried one of these. He was discussing with us her choice of the Bersa Thunder .380. I explained it was one of the few semi-autos we’d found that she didn’t struggle to work the slide. He cleared his 9 and let her try it. I was pleased to see she had no trouble with that slide. Once we’re past all the financial upheaval caused by moving to SC and then back to AL I may look into one for her. It sure look’s like a CZ75 clone to me. It has nothing in common with CZ75 besides the caliber and the tilting barrel lockup. The only downside to the Bersa is it’s weight and bulk, making it less desirable as a CC weapon. They are also susceptible to rusting more quickly than other blued-steel weapons I have carried, and cleaning up the rust invariably removes some of the too-thin bluing. I agree on the bluing. The newest polymer framed gun has much better finish than the older blued pistols. Thunder 9s are available with stainless slides if rust is a concern. The .380s are a blowback design. The 9, .40 and .45 Thunders are a locked breech design, making it not directly comparable to the .380 Thunder. I’ve got a Bersa Thunder .45. 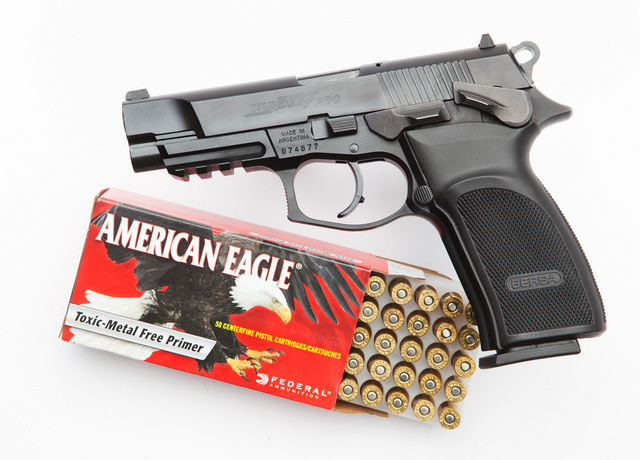 It’s the compact .45 ACP version of what Oleg has pictured above. It was a serendipitous acquisition about last Christmas time. It’s been OK. Shoots where I point it. I have no complaints other than the price of magazines and occasional hammer bite. Oleg — doing work for Bersa now too? No, not working for Bersa. I consider Rafael DelValle (national sales manager of Eagle Imports) a friend and so do photos and an occasional review. I shot the 45 compact like yours two years ago. Accurate and tame in recoil, but a bit sharp on the edges. The 9mm pictured is rather better chamfered. I’ve always liked Bersa pistols. The worst thing I can say about them is that extra magazines tend to be expensive and hard to locate. At least that used to be the case, I haven’t tried lately. I’ve a Bersa Firestorm & love to shoot it . . . . . its like an extension of my hand. Fun, fun, fun! I bought an older (pre-internal lock) Thunder .380 used. It had trigger reset and slide catch issues. I sent it to a warranty center who deemed it unrepairable. Eagle/Bersa replaced it with a brand new Thunder .380. I recommend the brand to friends without hesitation due to that experience. I’m actually considering switching to my Bersa Thunder 9 over my more expensive Beretta Px4 for future IDPA shoots, and I’ve had great experiences with my 3 Bersas (Thunder 22, 380, and 9). I do have to echo BryanP’s frustration with the price of magazines, though. The OEM mags for the 9 go for nearly $50 a pop, and you’re looking at not much less for the 380. That’s a bit painful for a “budget” gun. I’ve had pretty good luck so far with ProMag magazines for them, though. I still need to get with you again so can actually shoot the little Thunder 22.